If staying close to home isn’t an option, know that you can enjoy superior comfort in your conversion van with you wherever the road leads. While there are many travel options that offer some degree of both safety and comfort, when you need to cover distance with a large group, it’s vital to maintain harmony, and even the slightest discomfort can introduce a note of discord. Don’t let that happen to you! Don’t settle for simply adequate. 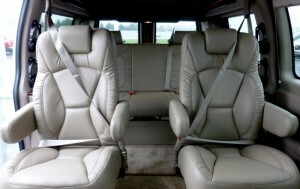 Take advantage of an option that affords a sumptuous, roomy, and safe journey for all. The team at Customizers is proud to present the gold standard of traveling luxury in conversion vans with their newest offerings of the Platinum Traveler and the Elite Traveler. The dedicated experts of Customizers begin with GMC Savana vans and transform them into two versions of traveling perfection. Let’s take a look at what each option has to offer you. Customizers’ vans offer travelers 40 percent more space than full sized SUVs–that’s a big difference when the miles start to add up. Both the Platinum and the Elite Travelers come with SafetyVan? High Occupancy Seating. This enables you to customize your van’s floor plan to accommodate up to 14 passengers in optimum comfort, without sacrificing a high standard of road safety. That’s because the crew of Customizers cares about you and your passengers as well as other drivers on the road. A safe trip is a great trip. In both options, you and your passengers will be cradled in quality leather upholstered elegance, with seating designed to render to rigors of long journeys effortless. Plenty of space to stretch out, play travel games together-or get into that book, video game, or movie-also make travel stress nonexistent. The Elite model offers state of the art entertainment systems in addition to the standard luxuries. 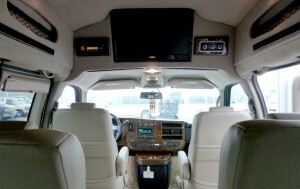 Your passengers can watch movies on flat panel television screens. With rear audio and wireless headphones, everyone can hear what’s being said during quiet dialogue, so no one will miss the important details of your on-the-road entertainment. But the list isn’t complete yet! Customizers offers their clientele two exclusive variations on their theme of excellence. Travelers can choose either the Platinum Traveler low top model or the Elite Traveler raised roof model to further tailor their traveling experience. 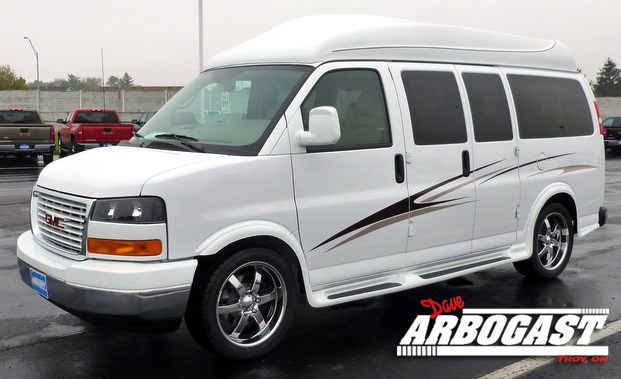 When purchasing a conversion van, it’s imperative that customers consider every angle. The crew of Customizers has. Redesigned for a smooth ride, the regular and low top models can be stored in a garage with an eight-foot clearance. Plus, they’re competitively priced to offer buyers a far better deal than most fully equipped SUVs. Visit Customizers today to select a model that speaks to your ideal of travel comfort.